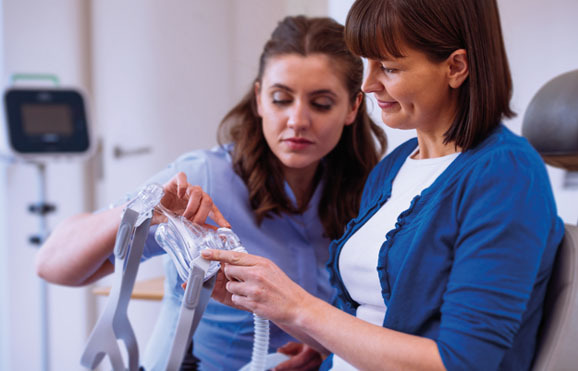 We are a local, provider owned medical equipment company that specializes in respiratory equipment and supplies (excluding supplemental oxygen). We are an accredited Home Medical Equipment company accredited by Healthcare Quality Association On Accreditation (HQAA). We offer high quality, state of the art CPAP/BiPAP machines and supplies. With over 80 combined years of sleep medicine experience, we provide professional, customized, expert mask fittings as well as CPAP/BiPAP setup and maintenance services. Successfully caring for individuals with sleep apnea often requires two key pieces: Physician services and a supplier (Durable Medical Equipment Company or DME) of the necessary equipment for treatment. As Sleep providers, we have always fully understood that providing good clinical care, correctly interpreting sleep studies, and prescribing the appropriate CPAP, AutoPap, BIPAP, or BIPAP AutoSV Advanced settings are of little value if treatment is unsuccessful. And successful treatment requires excellent compliance with these prescribed treatment options. The ideal DME Company recognizes their job doesn’t stop at supplying a CPAP unit, but should be an ongoing support system to help insure the individual’s compliance. And they should be ready and able to notify the individual’s prescribing Sleep Specialist quickly when problems do occur. These ideals resulted in 5 Sleep Specialists establishing DSM SLEEP LLC. Together they have over 80 years of Sleep Medicine practice. The Company has been designed to fully support the individual in complying with prescribed therapy. And the data supports these efforts. Compliance with therapy for DSM SLEEP LLC patients beat the national averages by 15 to 20 percentage points.